These last couple of weeks were strange. Most of my customers simply disappeared, bands were separated, musicians became sick, and in no time I had an almost empty week at the studio, and many expensive bills to pay. This happens frequently, economic crisis is part of our life here, but this time it´s taking my free time to gather new customers. Last week I couldn´t even find time to open Game Maker to, at least, lay some tiles anywhere. The project had these kind of delays before, but this is the first big one you people witness. I had no news on HyruleSwordsMan lately, he surely is busy too. Anyway. 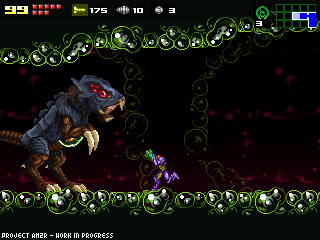 I´ll try to solve my work troubles as soon as possible, and make a teaser video with some Gamma Metroid footage. Thank you very much for following the project, for your great comments, and for your patience. Hey, we all go through tough times in life. We understand, and anyone else who has tried to make a game before surely knows how hard it is to find enough time for it. No matter how long it takes, I'm supporting this project as much as possible. hey man I understand. The work you have been doing is great so far, and Im willing to wait if it means i canplay this great game. it hurts to see you go through this situation. with all due respect, I continue to support it. if necessary wait until you know about the video. do not worry. you understand what's happening. Take your time dude, what you're doign is great! I know how that feels... keep on trying eh? I defiantly support this project! and I thank you again for the tips! Jake in Indy, USA here. I know how tough it is to find time to do side-projects--especially ones that don't pay money! What I can tell you is I've seen your work and think you're doing an amazing job. Take your time. Don't worry i'm sure we're all very patient and busy one way or another. Life is life, you do what you can to survive. It isn't easy for any of us right now. Prioritizing is understandable. On the other hand, just don't leave us behind either. What you're working on is truly special. I'd hate to see it be lost to time. Yeah, this is an example case of where securing your own livelihood is more important. Do what you gotta do, Doc. I can say no more than take your time, true fans like us aren't likely to go anywhere anytime soon. It's cool. Most of us are involved in something, to pass the time. We can wait. I'm writing a book (a long one, four volumes or maybe more), so I know what is it to work on a big thing. I'll be patient ! Hope the best for you and AM2R ! we're with you all the way man. i love this project and i always appreciate your frequent news updates. hang in there buddy, its always darkest before the dawn. Take all the time you need maybe give you nerves to work weell, it's what i think but noo, you just do what you have to do in your private life, like other bussiness and there it will be some free time to work on an advance for the Project, so be patient you to, i know DoctorM64 that you to want to finish this ever-game-waited but you will make it in time, forget the stress(haha i don't know very well english jeje) and keep moving cause you gonna make it!! I would donate but my mom won't let me. Anyway DocterM64 take your time, and I understand what you are going through. I doubt this will ever be finished (like all other fan projects) but admire your attempts to work on it. Keep your chin up! Finish it promptly when you can for the sake of the true fans but dont stress yourself too much. Take care. Life comes first. What everyone above me said. Except the fags. I believe you mentioned a sneak peek or something; make sure to keep it short, and don't reveal too much.